Anyway, I had a lovely time. Malta is so beautiful, I went two years ago and have wanted to go back ever since. My son seemed to like it too, I think (like me) he belongs in a warmer climate. I was so gutted to come back to the grey skies and rain, but life is life! The one disappointment of the holiday was the lack of polishes! 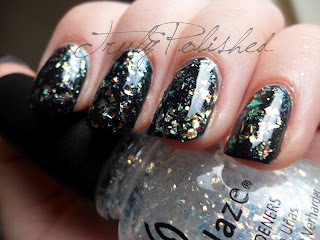 I wanted some Layla ones to bring back but they only had the magnetics when all I wanted was a few holos! So I ended up not bringing anything back with me... It's okay though, I have so much to show you all, and I got some amazing HITS nail mail today too, ten polishes to be exact, including the whole Phenomena collection, the first of which will be up on here tomorrow. Today I have a China Glaze polish to show you. I got this in a swap for a bottle of Max Factor Fantasy Fire. 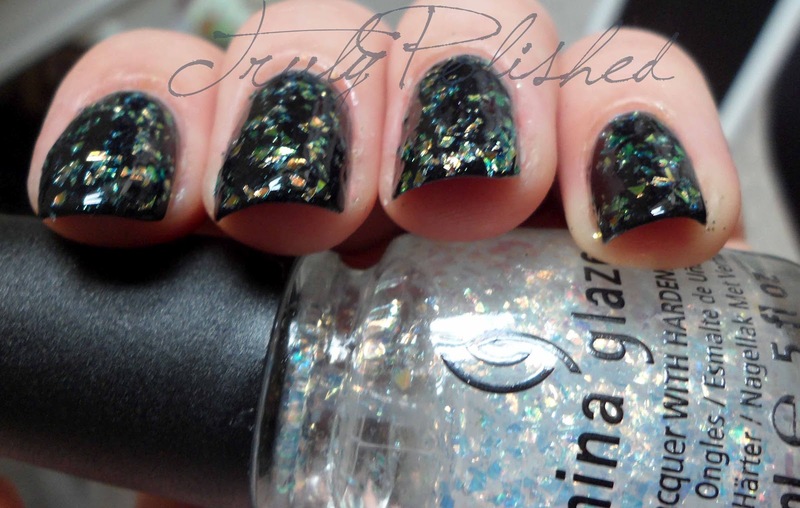 Luxe and Lush is from the Hunger Games collection that came out a couple of months ago. It's a flakie with a colour shift. However, this isn't the same as other flakies, the flakes are really big. The formula on this was terrible, the worst formula I've ever used. It was like trying to apply jelly onto my nails. I'm going to have to put some thinner in this when I want to wear it again. For the photos below I used two coats of Luxe and Lush over Smoke and Ashes from the same collection (I'll be reviewing that soon!) This dried horribly, so I really needed a coat of Seche Vite to smooth the polish out. All of these photos were taken in natural light. I didn't use the flash and there was certainly no sunlight!!! 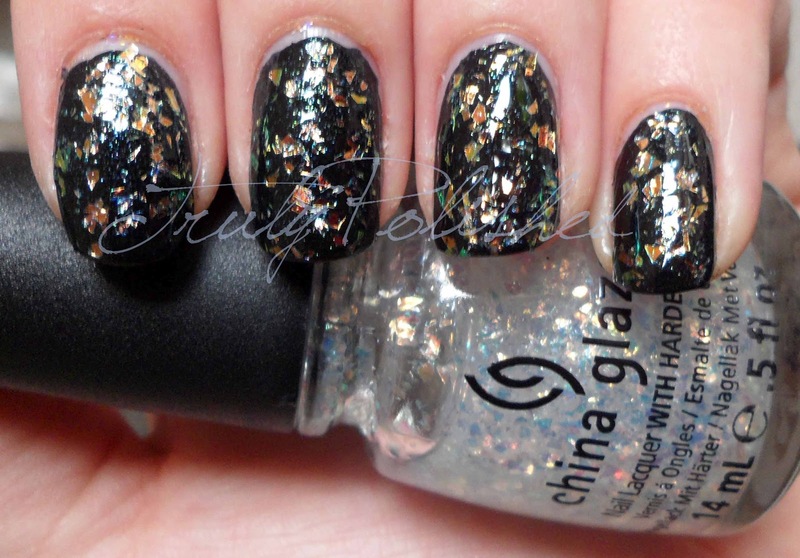 Side view, glossy Seche Vite! Overall I do like this polish and once I get some thinner, I'll wear it again. I particularly like flakies like this on my toes, I wore Nubar 2010 on my toes for about 4 months and this is a really chunky version of that. This polish is readily available in the USA but in the UK you can probably find it on eBay, or alternatively get some polish buddies over in America to send you some! As a side note... If you follow me on Twitter you'll notice I posted about having my own domain name! You can now find my blog at www.trulypolished.co.uk! I really wanted the .com but it was already taken unfortunately! Also, I've FINALLY set up an Instagram account, you can find me at @truly_polished on there, and on Twitter if you don't follow me already. Don't forget about my 30 follower blog giveaway! I'm only counting followers on here because all the companies etc that follow me on Twitter will mess up the selection. So if you want to be in with a chance of winning two (probably three actually) polishes, start following me on here, I'm only 8 followers away! 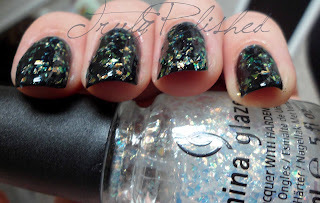 I'll be back tomorrow with a gorgeous HITS Phenomena........ See you then!